GPMI can manufacture all your bushing needs and per printed items out of all alloy steels 52100, 8620, 4130, 4140, 4150, 4340, & 6150 as well as your carbon steels such as 1018, 1045, 1117, 1144, and 12L14. We also have the manufacturing capabilities using tool steels such as A-2, D2, H-13, L-6, M-2, O-1, O-6, S-5, S-7, CPM and titanium. 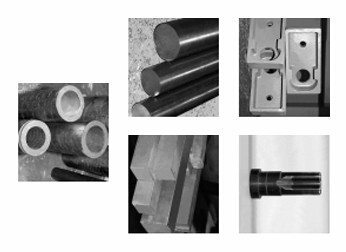 Other materials consist of aluminum, all types of stainless steels, chrome rod, drill rod, TGP, D.O.M tubing, brass and bronze. GPMI also can manufacture your prototype parts into your production runs from hot or cold forgings, aluminum, ductile or gray iron casting. With such a wide range of capabilities, GPMI is ready and able to meet your needs with whatever material you require.